A friend found this beauty at a garage sale, and thought I might like it. "Like" is an understatement...It was love at first sight. She was built in February 1962, and recently had her 50th birthday. Age and neglect have taken their toll. Everything needs a good once-over clean and polish. My goal is to get it back in good working order. After that, we can think about mods to make it better. From what I've read, these machines have a steep learning curve. And have a personality of their own. I like that. I'm currently using a "Silvia" with her own stubborn ways. They'll be a great pair. First up is the heating element. It passed the continuity test, with no leaks to ground. As you can see, 3 of the 4 studs are broken. It would blow the budget to replace the element. So a repair is needed. Found this forum where the poster came up with a great fix: http://www.home-b...19-20.html. It would never get the UL seal of approval. And that's fine. It'll always be plugged into a Gfci outlet anyway. Next is disassembling the group. On the early (1960-70) models the inner sheath of the group was only removable with a special tool. The two on the left are my failed efforts to make that tool. Eventually the time-versus-money logic kicked in, and I coughed up the $42.50 and bought one pre-made from Orphan Espresso. It still required a lot of effort to break the threads free, but worked perfectly. More to come. All the parts are currently soaking in a water / citric-acid bath. I'm in awe of how well built this machine is. Modern appliances tend to use the minimum thickness of materials they can get away with. By comparison, this thing is built like a tank. Thick, solid brass everywhere. No wonder its still functional after 50 years of abuse. Sorry about the confusion coffeeroastersclub. The link with the pictures you saw isn't my machine. I used it for reference purposes. My boiler plate/element has 125v stamped on it. Found some time to work on the base today. It's cast aluminium, with grey hammertone paint. The underside had what looks like old crusty varnish on it. A drill with a wire brush bit stripped it right off. A palm sander made quick work of the topside. It''ll be primed, top-coated with a dark grey hammertone, then sealed with spar urethane. The switch is an ON-OFF-ON toggle that controls the two heating coils. Originally the machine had to be plugged in to power it on, with the switch toggling low or high mode, then unplugged to power off. What a hassle. I = low, II = high. Subtle yet effective. An indicator light is mounted front and center, It'll light up whenever the coil is energised. Regardless of mode. Made much progress this week. Finished the base. The first coat was an etching primer intended for aluminium. Followed with 2 coats of hammertone. And sealed with 3 coats of oil based spray polyurethane. This is a view up into the grouphead. The hole in the center is for the piston shaft. The recessed area holds the shaft seal, followed by a brass washer, and held in place by a C-clip. The old c-clip was mild steel, and completely rusted out. Problem was, bits of the old clip were stuck in the tiny channel cut in the brass. It appears that as the steel rusted, it expanded just a little bit, and locked itself in place. No amount of picking with dental tools could get it out. It's a dremel bit chucked into the drill, which could be spun at very low rpm. It worked a charm. Now I know how a dentist feels, horrified by the damage a slip could do. The rest of the parts, seals, and gaskets went together quickly. Not very interesting. I changed my mind about the power / HI-Low mode switch. I decided to go with an off-on switch which powers the 200w coil, with a switch loop to for the 600w coil. That way both coils can be run at the same time for warm up / steaming. With the 200w coil as a brew temp sustain. Very simple wiring. Look how much room is available for other gizmos and doodads. Glamour shot. Aint she pretty? Awesome. You do really good work. The hammertone finish on the base close-up shot looks very nice. Here's hoping I stumble across one of these in my treasure hunting adventures. PID with a nixie tube temp display!!! 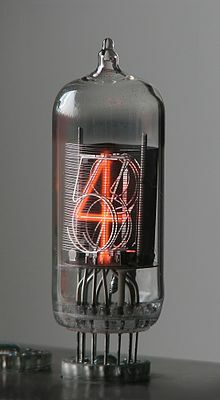 The nixie tube is an awesome idea. It totally matches the aesthetic of the machine. First, I'd like to be able to pull a decent shot on the original setup. My girlfriend is getting a kick out of watching me make a funny face - then spit shot after shot into the sink. I'm at 1.5# of wasted beans so far. None of it being what I'd call drinkable. The HB site is full of useful tips and tricks. But, I've yet to have that magical moment where all the pieces fell into place. Pre-heat, Grind, Tamp, Flush, Lever Pressure, 1/4 Pumps at the top, Etc. Cranky little B^$%#. Yep...Cranky is a good name. I was originally going to get into espresso by buying a La Pavoni, but heard that they are cranky. Having never pulled a shot in my life, nor having someone to teach me, I moved on to something with a better learning curve. I ended up with an E-61 machine. You have a Rancilio, so you already know how to pull a shot. Aren't you glad we both didn't begin with that little monster!? What is the issue with the shots? bitter, sour, all of the above? I assume you have been able to pull decent (although somewhat inconsistent) shots from the temperamental Silvia? You may want to pull a shot of water into a styro cup and test the actual water temp as a starting point. We can troubleshoot from there. I am sure someone has tried the PID conversion and I would be keen to find out if it works ? Jon, I think you're mistaken, isn't that a victorian era time machine? Back in 2005 I was in the market for my first espresso machine. It was a toss up between the Pavoni, Silvia, and Francis X5. I ended up getting the X5 mostly because it was the cheapest option. I used it up until I got the silvia 6 months ago. It was a little workhorse. No problems, and fairly consistent. I doubt I'd be here today If I picked the Pavoni. Youre right, She's a little monster, but, an endearing one. I'll stick with her, with Silvia's consistency being a balancing force. That's insane. I want one. Probably out of my price range though. I just ran her through a warm-up, 2 shot pull, with flushes between shots. From cold, the boiler was heated on high (800w) till the steam started to purge, and first few drops came out of the pressure relief tube. Then set to low (200w). Raised the lever to flush excess steam/pre-heat the group. 184f in cup. Grind, tamp, locked in machine. Lifted lever to top, held 10 seconds, then cranked down slowly. Around 20# of force required, 15 seconds till bottomed out. Came out thin. Tasted sour. 154f in cup. Flushed again. 193f in cup. Same as first. Extracted....Better, thin crema (light), slightly bitter, liquidy. 165f in cup. Flushed again - 204f in cup. For reference, I used the same grind setting as Silvia's. #7 on the Rocky. The beans / grind produce nice, sweet, fluffy espresso on the silvia. I had a la Pavoni Europiccola in the late 90s. It was over 30 years old then, wish i had kept just for the cool factor. Moved on to a Silvia/Rocky combo. Now I have a VBM minimax 2 group & SJ mazzer in the kitchen. In the garage I have a Reneka Techno, a la Pavoni Pub 2grp and a la Cimbali M28 2grp it's a long story. First, do you think the group/portafilter are coming up to full temp? 20-30 min warmup is a general rule but I have no idea if your machine would take more/less time. Second thought is to start grinding finer until your pull time gets closer to the 25 second +/- range. Only other thing can think of for now is the headroom for the shower screen. Maybe your puck is contacting the shower screen breaking the puck and causing channeling? Dose and tamp your basket and lock in place. Unlock it and make sure there arent marks in the puck from contact with the shower screen. If so, reduce the dose and grind finer from there. Do you have the user manual? Dunno how helpful it might be. This claims to be the best instructions. Sounds like you're growing great collection. What's next in line to bump the VBM to garage status? It'll have to be a beast. Thanks for the links Dan. The "guru" site is a good one. The official manual was entertaining as usual. The thermal issue is one of the major faults of this machine. It tends to get too hot - too fast. The group overheats quickly. After 4 pulls of the lever - it's crosses the temperature threshold, and produces burnt + bitter tasting shots. The ideal routine is to preheat for 5-10 min. Then purge steam pressure from the boiler. And pull 2 shots within the next 10 min. After that - the group needs a cool-down period. The machine was designed to pull 225-235f water into the group. Which acts as a heatsink, cooling the water, and delivering 190-210f water to the basket. The thought crossed my mind to create a thermal break between the grouphead and the boiler. Which would slow the heat exchange with the boiler body. Which gets insanely hot. jkoll42 - You mentioned headroom between the puck and dispersion screen. Occasionally I'll notice that there was screen contact post-extraction. Most of the time the puck looks clean. Some shots show severe erosion - an actual pencil eraser width indent that is half the depth of the grounds. I suspect the 50 year old shower screen might be the culprit. The portafilter basket is newer, and has very consistent sized holes. Will do a few more cycles with various grinds. And report back.